The J.B. Hunt team cheers on a driver maneuvering through the course on Saturday. 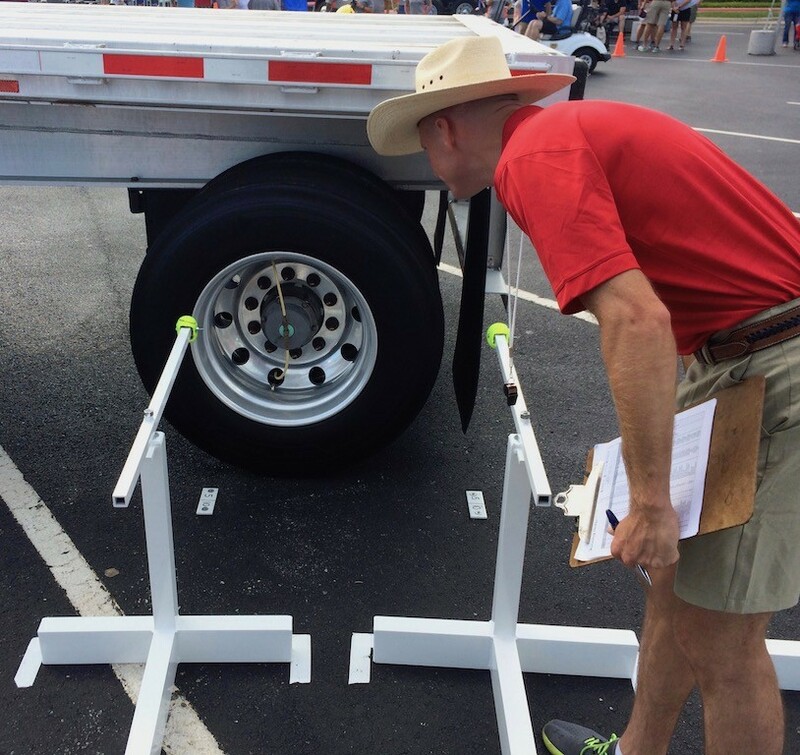 On a hot and humid Saturday (July 15), 170 truck drivers competed in the 50th annual Arkansas Truck Driving Championship of the Arkansas Trucking Association. Cheering them on, were family, friends and co-workers of the companies for whom they work. The drivers took turns testing their skills in the U-shaped course in the parking lot at John Q. Hammons Convention Center in Rogers. They operated various styles of big rigs, including ones with four and five axles and with sleeper berths, and pulled trailers, such as twins, flatbed and tanker. Straight and parcel trucks were also among the truck styles in the competition. He praised the family environment of not only the event but also the trucking industry. “The thing that we’re most proud of is that for 50 years, our organization, our industry has celebrated the profession of drivers and celebrated those who have committed themselves to safety and have celebrated in this way the contribution they have made to our industry and our economy,” said Shannon Newton, president of the Arkansas Trucking Association. Newton explained the overall aspects of the championship have remained the same over the years, including the drivers’ commitment to safety, understanding of the trucking industry and ability to successfully maneuver big rigs through the driving skills course. Scores from the pre-trip inspection, written exam and driving skill test are used to determine the winner. Andrew James of the Arkansas Highway Police inspects how well the driver made the left turn in the driving test. Those who win each in each of the nine classes of the competition will go to the national competition in August. But just getting to the state competition is a challenge. While the major aspects of the championship haven’t changed, there are differences in the competition from year to year. The driving skills portion of the competition changes each year to challenge the drivers who’ve competed for years in the event. Offset alley, which includes barricades allowing for just enough space for big rigs to narrowly maneuver through, hasn’t been part of the course for years. Randy Lovell, who’s driven for Walmart Transportation for 19 years, has competed in the event 27 times. Lovell said he has a good safety record and likes to compete. He also likes the comradery. The event allows him to meet a lot of people and gives him the chance to compete nationally. He’s competed nationally four times, and last year, he won the flatbed division in order to compete at nationals. This year, he drove in the same division in hopes to defend his title. After completing his 27th drive in the competition, Lovell said it was “better than the first time.” He won first place in flatbed and will go on to nationals again. At the driver roll call on Friday (July 14), Jason Wing, chairman of the Site and Field Committee, said the event this year had the largest number of drivers registered since it was hosted between two locations, Springdale and Lowell. Before the recession, about 200 drivers were competing in the event, and since the recession, the number of drivers competing in it has been rising each year, said David O’Neal, director of safety services for Arkansas Trucking Association. Before the event moved to the John Q. Hammons Center, it was hosted at two locations: the Holiday Inn in Springdale and the FedEx terminal in Lowell. In 1967, the first championship was hosted at Park Plaza Shopping Center in Little Rock. “We actually spend about 10 or 11 months preparing for this event, because of the size of the event and the sheer number of volunteers that it takes to pull it together,” Newton said. About 200 volunteers, which include employees of the member companies of the trucking association and Arkansas Highway Police, helped put on the event this year. Other parts of the three-day event included the 14th annual Arkansas Technician Championship and the Arkansas Commercial Motor Vehicle Inspection Competition. Winners of those events also go on to compete on national and international levels. At the national level, the following nine winners of the Arkansas Truck Driving Championship will compete in the American Trucking Associations’ 80th National Truck & Step Van Driving Championships on Aug. 9-12 in Orlando, Fla.
Rhein also was grand champion of the event. Winners of the technician championship, Eric Rusk and Steven Frye, both of McKee Foods Transportation, will compete at American Trucking Associations’ SuperTech Challenge in Orlando on Sept. 16.